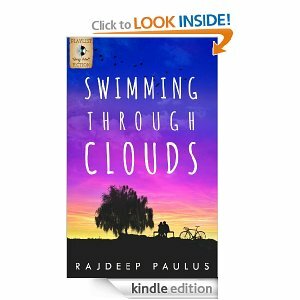 I would firstly like to thank the author Rajdeep Paulus for sending across her book Swimming through the clouds for a review. It’s been a while I read a YA fiction and it was thoroughly refreshing reading her book. I had began to avoid YA fiction off late as they seemed to be having the same track and were beginning to drain me as I read them. But this book was different from the usual YA books that are floating around. The characters seem to be so real that at some points I cringed with them, shed copious tears and smiled seeing them happy. Swimming through clouds is a beautiful narration of heart touching tale between two people who are lost in life and are trying to find its meaning. They help each other evolve as they struggle through various stages of teenage and I truly admire the author for dealing with such delicate issues so beautifully. The narration is so beautiful and lucid that it immediately connects you to the story making you want to keep reading it page after page so much so that when it ends you feel emptiness suddenly. As if you wanted the tale to just continue like that. I experienced the excitement of teenage crush, felt the pain of physical violence, pain of having lost a parent, the beauty of siblinghood and a whole lot of mixed emotions amidst these wonderfully written pages. I would recommend this book for people who enjoy YA fiction as this one is surely not like other YA stories. The author has done an excellent job is writing a gripping story which moves you and leaves you feeling blessed! Rajdeep Paulus, author of Swimming Through Clouds, is mommy to four princesses, wife of Sunshine, a coffee-addict and a chocoholic. As of this past June, she’s a Tough Mudder. To find out more, visit herwebsite or connect with her via Facebook, Twitter, Pinterest, orInstagram. Love discovering new teen fiction? Download this FREE ebook sampler from Amazon! Featuring some of today’s strongest indie author voices, this Fall teen reads sampler is sure to connect you with your next page-turning read. Perfect for fans of Sara Zarr, Meg Cabot, Jennifer Hubbard, Melody Carlson, and more. Download the drama before it’s too late! Offer expires September 17. For even more of today’s best indie teen fiction, visitPlaylistFiction.com. I have gone through the book reviews here. You tempt people through your art of presenting the review. Nice. I can just say thanks Rudraprayaga.. it feels good to know that my words can do that!! Thanks so much for writing a review! Would you mind posting a small portion on Amazon and then linking 'To Read the full review" to your blog? Will be a nice way to get more traffic as well. Feel humbled by your encouraging words. Sure Rajdeep it was a pleasure reading this one! !